“Each Line Is A Crime” is the group exhibition to explore the theme of “Art and Measurement”. The show presents three works by Birgit Auf der Lauer & Caspar Pauli (Germany), Robert Estermann (Switzerland), and Katya Sander (Denmark), each addressing different political, economic, aesthetic, and ethical issues of measurement in contemporary society. Auf der Lauer & Pauli engage in issues of human trafficking at the borders and on the measurement of life. 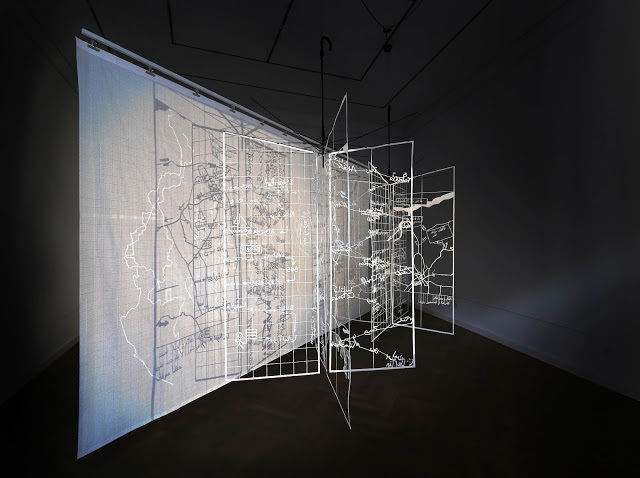 Wegskizze und Grenzlinie (2017) is a suspended sculpture consisting of a series of cut-out maps that show the escape routes used for crossing national borders in the Middle East. Most of these borders were negotiated during the colonial period, otherwise newly defined during the independence between the 50s and the 70s. The organic lines on systematic grids cross over the representational lines which demarcate the life/death border. The work confronts the viewer with the kind of measurement of life shaped by geopolitics and transnational economies. Spectacular Interferometry (2017) is a series of very large digital prints by Robert Estermann. Each print consists of two different sets of drawings; one is his recent abstract drawings of beaches, the other is the pseudo technical drawings of automobiles that he drew at the age of twelve when he was obsessed with the design and measurement of cars. In Spectacular Interferometry, the artist juxtaposes them into a single pictorial plane and plays with the idea of measurement in the “(non) scale of a modernist dream” to interfere with his pragmatic approach as child car designer. FINANCIALISATION (2016) by Katya Sander is a three-screen video installation to search images that depict relationships between contemporary statistics, calculations, and the global financial system in everyday life. Utilising lines, colours and rectangular forms with the insertion of an interview with French sociologist Emmanuel Didier, the artist connects the measurement used in the system of financial capitalism to artistic imaginary and successfully portrays the peculiarities behind the system. The exhibition aims at provoking viewers to reconsider the effects of contemporary measurements and to exercise them conceptually, methodologically and imaginatively. The exhibition is held on the occasion of the release of her new publication, Towards (Im)Measurability of Art and Life. The title of the exhibition is originated from a subtitle of the blog Robert’s Lines by Robert Estermann. The exhibition is kindly supported by the Swiss Arts Council Pro Helvetia, and the publication is made possible by the support of Stiftung Kunstfonds e. V. and by Stiftung für moderne und zeitgenössische Kunst.